The Federal Republic of Nigeria ranks amongst the most populous nations in the whole of Africa. Along its coast are some of the country's principal ports, including those of Port Harcourt and Lagos. 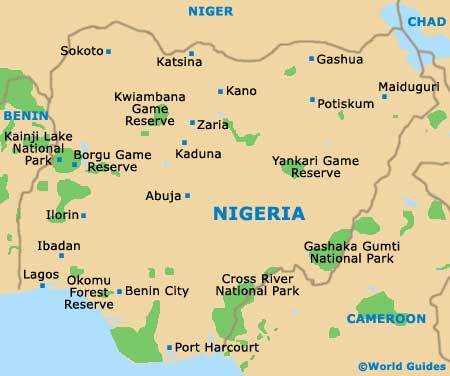 Nigeria is divided into a series of different regions, namely south-western, south-eastern, central, eastern, northern and north-eastern. Abuja, the capital city of Nigeria, is situated at its geographical centre, within the area named the Federal Capital Territory (FCT). Other significant cities include Benin City, Calabar, Ibadan, Jos, Kaduna, Kano, Osogbo and Worri. 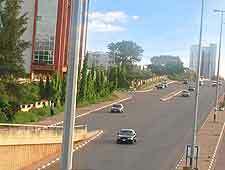 Abuja officially replaced Lagos as Nigeria's capital city in 1991. However, work on creating this modern planned city actually dates back to the late 1970s when construction on the first phase of development got underway. 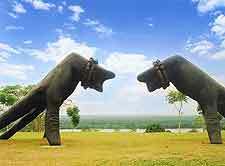 Chosen for its central location and favourable climate, Abuja offers plenty for visitors to see and do. Attractions include the Aso Rock, the Central Mosque and the city's zoo. More information about Abuja. Situated on Nigeria's coastline, the former capital of Nigeria remains one of the country's largest cities, with nearly eight million inhabitants. The city of Lagos includes two islands - Lagos Island and Victoria Island, which are connected to the mainland by three main bridges - the Carter, the Eko and the Third Axial / Mainland bridges. 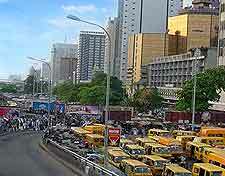 Lagos Island is essentially the city's business district and where visitors will find most of the markets and tourist sites. Located between the Lekki Peninsula and Lagos Island, Victoria Island is home to some of the wealthiest residents of Lagos, while there is also a mainland district. Lagos comes with many natural sights and tourist attractions, including Lagos Harbour, Oba's Palace, the Shitta Mosque and the city's National Museum. Situated in the south of Nigeria and directly to the north of the meandering Benin River, Benin City is the capital of Odo State. Benin City is perhaps best known for its fine bronze art works, as well as its royal palace - the Oba Palace. The city has strong historical links and information about its past can be seen at its National Museum. Founded in the 10th century, Benin City was once the capital of the royal Benin Empire. The Nigerian town of Badagry dates back to the 15th century. It was infamously once the centre of Nigeria's slave trade, when some half a million African slaves were transported from Africa via Badagry to the Americas and Europe. 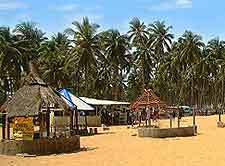 Today, Badagry is a large town and a busy tourist destination. Places to visit include the town's small museum to slavery, and various surviving buildings relating to the slave trade, such as the Vlekete slave market. Comprised of a number of interconnecting villages, the town of Arochukwu is located in south-east Nigeria and comes with several historic sites worthy of a visit. These include its Ibini Ukpabi shrine, known as Long Juju, which dates back to the 17th century and once played an integral part in determining guilt in cases such as murder and even witchcraft. 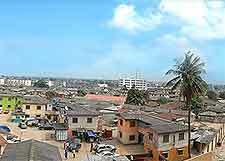 Situated in the south-east region, Calabar has been an important port city since the 16th century. Until the 19th century, it featured prominently in the African slave trade. Attractions to look out for in Calabar include its beach and botanical gardens, as well as Nigeria's first Presbyterian church and earliest barracks. A large city lying on the northern side of the country and once named Zazzau, Zaria was once the capital city of the Hausa Kingdom. As such, it was a prosperous trading city where camel trains met to exchange salt for grain and slaves. Today, Zaria is home to the country's largest and most prestigious university - the Ahmadu Bello University, which was founded in 1962 and now boasts a student enrollment of more than 30,000. Kano is the third-largest city in the country and lies within Kano state, where it has become the state capital. Also a popular tourist destination, top attractions here include Kano Zoo, the Gidan Makama Museum, Emir's Palace, the Kano State History Museum and the nearby Great Mosque. Worth a visit is the historic Kurmi Market, where you will discover a mind-boggling selection of textiles. Guided tours of the pits once used to dye clothes are also likely to be of interest. Kaduna is a busy commercial town situated in the north of Nigeria. Discovered in 1913 by the British, it was once the capital of the northern-most region. The top attractions here include Lugard Hill, the House of Assembly for Kaduna State, the River Gardens, Kaduna's large market and Murtala Square, where many prominent local events are staged.